Seeking a career at E-Comm? Here’s some information to help guide you through the process. Can I volunteer at E-Comm? As much as we love volunteers and community service, our work requires very specific security clearance and significant training. So unfortunately, we can’t offer volunteer opportunities. You might check with your local police agency – they have community-policing centres staffed by volunteers. What is the difference between the 9-1-1 regular call taker program and the student program? If you are a regular full-time employee, shifts are 12 hours, on a four days on and four days off rotation (example: two 7:00 a.m. – 7:00 p.m. shifts and two 7:00 p.m. – 7:00 a.m. shifts). Students are hired to help over the higher call-volume times and must be available during evenings, weekends, and holidays (all statutory holidays) for a variety of shifts. The student program will include daytime, evening, and overnight shifts depending on the student’s availability during their school term schedule. What security clearance is required? Upon a successful offer of employment from E-Comm, a candidate will also be required to pass a Vancouver Police Department (VPD) Enhanced Security Police Clearance, as well as a Royal Canadian Mounted Police (RCMP) Reliability Security (“RRS”) Clearance. These are carried out by the VPD and RCMP, facilitated by E-Comm. I live in another province. Can I work at E-Comm? We welcome any candidate who feels they would be a right fit for our organization and our work, but we do have specific requirements. They include attending an in-person information session, testing session and interview, which may be difficult for you if you are outside of Metro Vancouver or the Fraser Valley. If that’s the case, you may wish to wait until you have relocated to the Metro Vancouver region before applying, so you are in a better position to attend. What if I live outside of Canada or I am in Canada, but on a Visa. Can I apply for positions at E-Comm? There is an open posting, but jobs are set to start “x” number of months later. What does this mean? E-Comm’s process for filling a call taker position is a six-step process that takes a few months to complete because of security clearance interviews and testing session dates. We recommend starting your application early to ensure you will complete all the requirements before the start date. I don’t see an open posting; when will you have one? How can I submit a general application? How will I be notified when there is a position available? See the Apply Now section of this website for our current opportunities. You can set up a notification alert for a position, when it becomes available on our career portal. Anyone who has set up an alert through our career portal will automatically be notified when a recruitment testing session becomes available. You can watch for E-Comm job postings on Twitter. What type of education do you require to be a 9-1-1 call taker? A grade 12 diploma is required. While not mandatory, supplemental courses in public safety, emergency communications, or criminology would all be considered assets along with an in-depth knowledge of British Columbia’s geography. How can I make myself the ideal candidate? Wow, that’s a tough question! Have you checked out the 9-1-1 call taker self-assessment? That’s a great place to start. 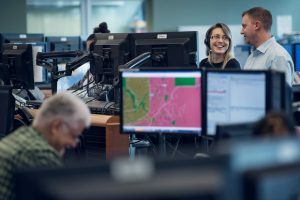 Overall, courses in public safety, emergency communications or criminology would all be considered assets along with experience working in a high-volume call centre or other high-intensity customer-facing jobs. A good knowledge of B.C.’s geography is helpful. But we welcome applicants with a varying experience and circumstances. Are there internship/co-op opportunities within E-Comm? We do actively hire part-time and full-time students into our engineering-related disciplines. If you are in full- or part-time studies and are interested in becoming a 9-1-1 call taker, we recommend you apply to our student program. I’m in high school. Can I apply to the student program? We love your enthusiasm, but we need you to wait until you have graduated as our minimum education requirement is a grade 12 diploma or equivalent and enrollment in a post secondary institution in the Lower Mainland. We welcome your application once you have enrolled your first year at a post-secondary institution. Are there part-time employment opportunities for 9-1-1 call takers? Our 9-1-1 call takers are hired to work full-time on a rotational shift work pattern. The only exception is employees in the student program who work on a part-time basis while enrolled in school. 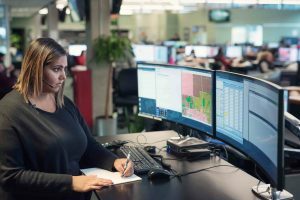 What does a 9-1-1 call taker schedule look like? What is the training schedule for a 9-1-1 call taker? The training process can take up to nine months due the nature and complexity of the calls we take each day. During training time, you will learn through presentations, open and closed book testing, role-play and live calls led by trainers and mentors. What support is offered to operations employees? E-Comm values the mental and physical well-being of all its employees. To support our employees at our main centre, we offer a full kitchen, a quiet lounge, and gym. Other locations also have access to kitchen facilities and free parking. No matter which location, we offer employee support services, health and wellness activities and staff events. Across our organization, you are surrounded by peers who share similar experiences and can often provide guidance and support. I have missed the deadline to complete my video submission. Am I no longer eligible? You are still eligible for the job competition you have applied for. However, if your video submission is past the deadline, it’s only fair we look at others who met the deadline first.